When Scotland’s foremost oil industry magnate, Sir Ian Wood, made a keynote intervention during the independence referendum campaign to warn that predictions about the future value of the North Sea to the country’s economic future were, frankly, a bit over the top he found himself at the centre of a political row. This was an industrialist who had found himself lauded by both David Cameron and Alex Salmond, and carried out a keynote review into the vital industry which was widely welcomed. But heightened hostilities on both sides at the time meant the value of impartial advice was only measured by how much it supported their own argument or not. The SNP Government’s white paper on independence talked of up to 24 billion barrels of oil being left, while other wildly optimistic predictions from the Nationalist camp talked of £365 billion of revenues in the decades ahead. Not so, claimed Sir Ian – he said about 15 billion to 16.5 billion barrels was the most future generations could expect to recover. Fast forward a year and a half and it is Sir Ian’s own predictions which seem like wishful thinking as the impact of the global oil price continues to devastate the North-east economy and its value to the UK Treasury – about £130 million this year – continues to nosedive. The latest report by industry body Oil & Gas UK paints a miserable future for the industry if the price continues to stall at about $30 a barrel. About half of all UK fields will soon be operating at a loss, with a stark warning of “ongoing job losses”. Even before the price collapse, falling production levels were always a concern. This has now all but ground to standstill. The collapse in the North Sea has been a difficult issue for Ms Sturgeon and the Nationalists. She has faced opposition criticism for being slow to react to the crisis in Aberdeen, and one of her backbench Aberdeen MSPs, Dennis Robertson, was forced into an embarrassing apology after claiming that the North Sea was “booming” despite tens of thousands of job losses. It all feeds into an opposition narrative that the SNP simply did not want to acknowledge the full extent of the crisis facing the industry in Scotland because it would only serve to highlight the gaping hole in their plans for independence. And even when they do intervene, it’s usually to call on Westminster to do more. 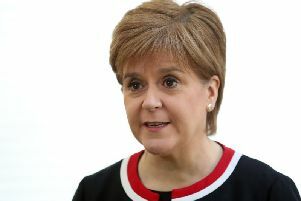 In fairness, this is hardly born out by the facts, with Ms Sturgeon having already set up a jobs task force to help those affected, while the Scottish Government has put up the bulk of the funding for a £500m package as part of the “City Deal” to help re-invigorate the ailing North-east economy with a focus on new building projects. The vital supply chain industry, which covers almost all activity in the North Sea, was also at the centre of a new blueprint unveiled recently by ministers aimed at ensuring survival in the new low-cost oil future. The only hope for the North Sea in the immediate term appears to be “significant” tax breaks and this is something that lies in the hands of George Osborne and the Treasury. But Sturgeon may yet have some political fallout to handle. Next month marks what would have been Scotland’s “independence day” had the country voted Yes in the referendum. It is likely to be met with a flurry of media coverage on the position Scotland would have faced. The massive financial black hole presented by the oil industry crash will be at the centre of these and may yet have an impact when voters go the polls in the Holyrood elections in May.